The rhythm of nature sings the loudest in the high country. Walk slowly up the path, feel the cool breeze on your face, hear the sounds of wind in the pines and the gurgling stream beside you, and you will hear the music your soul longs for. While the senses detect the melody, the heart will begin to hear the delicate messages of nature if only we quiet our hearts and listen. What is the message of the frolicking sound of a stream as it forever flows downward to the sea? 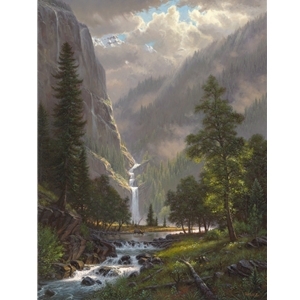 And what can we learn as the gentle brook cascades over a cliff, to be separated for a time in isolated droplets and then be reunited in the thunderous splash at the base. What is the meaning of the moan of the wind in the needles of the pines? What new growth and color can be brought forth from an avalanche? What beautiful sculpture might take shape from the wind and the rain? The Creator has messages for you in his creation - tender words which give meaning to the harshness of life, quiet lullabies that sing of your value and place in the the world. Go ahead and take that stroll so you can hear the Highland Song.